Picasso bathers are a series of paintings created in the “African period.” It is then that the artist begins to work on ideograms (that is, drawings that symbolize certain ideas). The paintings are full of different characters, based on Iberian art. The basis of the motif of the author chooses naked women in the background of nature. To work with models, Picasso had his own personal workshop where the model could relax and assume the necessary position. The motive for the series of Bathers served as a symbol of pristine and natural. These paintings accompanied Picasso throughout his career. The artist drew his bathers year after year. He made many sketches and sketches for this plot, trying to perform them in different artistic styles. 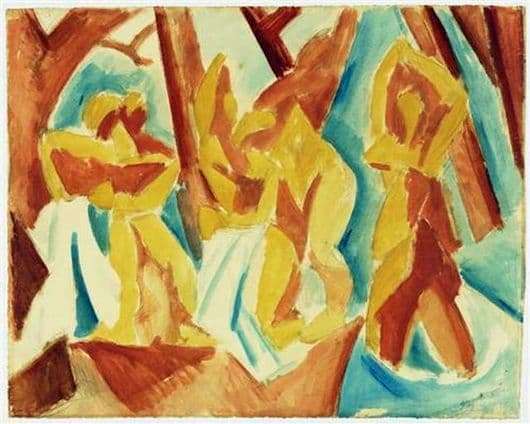 At this time, the direction of the series of bathers develops in the motif of the 1918 painting. 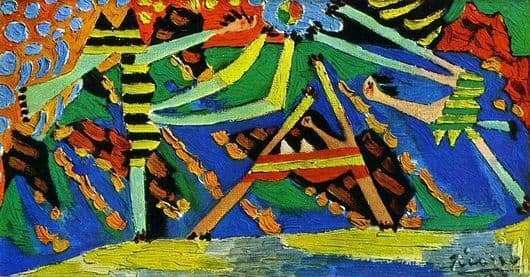 At that time, he was already a famous master, who created cubism and created abstract subjects. However, in his bathers, he unexpectedly returned to the classics, I wish to diversify the school with their innovations. At the same time, he is aware of all the shortcomings of the classical trend, which he says in new works. His bathers are depicted in an unnatural position, with arms and legs turned out. It seems that even a second and they laugh in the face of the viewer. All movements of bathers are practically broken. Picture of the master “Bathers with the ball”, written in 1928. Here his images are ugly simplified. Three silhouettes are made of ordinary cardboard. The language of symbols, invented by the author in the African period, appears in this picture.